I am frequently asked about the process I use to create/design my silk wearable art pieces and the story behind each one. I'll deconstruct March at Tacloban as an example of how I work. In this case the story came first . . . My grandfather's survival of the Bataan Death March in 1942 and my annual participation in the Bataan Memorial Death March at White Sands, NM. Every year, I look for ways to connect with my grandfather and the other men even though it has been over 75 years. At the March in 2017, I marveled at the yellow wild flowers that, due to the rain that winter, were everywhere; I've never seen them before or since. 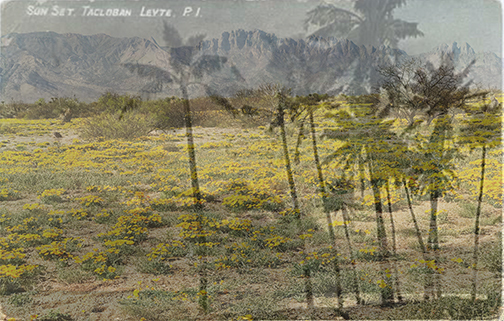 For this piece, I began with a vintage postcard from the Philippines that I found. Leyte is the site of General MacArthur's return to the Philippines after their surrender in 1942. Every year, I see different sights on my 26.2 mile journey. I doubt the original marchers saw, or if they did had any interest in, the surrounding landscape. From original images I have seen, the road was dusty and frequently barren of foliage. Using Photoshop, I collaged the two images. The resulting piece overlays my experience of the landscape at White Sands with the resiliency of the men who marched in the original Death March and survived.